WESTFIELD, Massachusetts - March 1, 2018 - The new Model 110 Varmint from Savage delivers the fit, feel, features and impeccable accuracy varmint hunters need to reliably connect with small targets at long ranges. Shipments of these firearms are currently being delivered to dealers. The Model 110 Varmint’s AccuFit system lets prairie doggers and other varmint hunters easily customize the length-of-pull and comb height for a personalized fit, while the user-adjustable AccuTrigger offers a crisp, clean pull. Together with the AccuStock, which secures the action three-dimensionally along its entire length, the Model 110 Varmint provides the fit and function of a custom rifle—right out of the box. 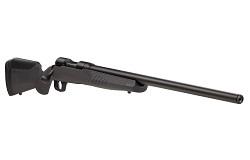 Its 26-inch heavy barrel is button rifled and held securely within a rugged synthetic stock. Plus, it features a detachable 4-round box magazine and fast-handling oversize bolt.